Metastatic cancer (any cancer that has spread from the area it started to other areas of the body) is responsible for 90% of all cancer-related deaths. Dr. Danny Welch has devoted his career to finding out what causes cancer to metastasize or spread – and how the spread of cancer can be prevented or predicted. Dr. Welch and his team have discovered eight of the more than 30 known metastasis suppressor genes. They have also recently discovered how some of those suppressors function and are designing therapies to take advantage of their mechanisms. One of their research areas is focused on understanding how KISS1 proteins suppress metastasis so they can design molecules that mimic the proteins and either prevent metastasis from happening or maintain metastatic tumors in a dormant state. Through recent research, they have also identified genetic changes that predict whether patients will or will not develop metastasis. At least some of these changes occur in mitochondrial DNA, which is present in every cell and small enough to be rapidly analyzed. These results could mean that a simple blood draw and analysis of mitochondrial DNA could be used to help doctors guide their strategy to treat patients. Danny R. Welch, Ph.D., received his bachelor’s degree in biology from the University of California at Irvine and a Ph.D. from the University of Texas-Houston in tumor biology. Following his doctoral research, he became a research scientist at the Upjohn Company and Glaxo pharmaceuticals. At both companies, he was responsible for pre-clinical testing of anti-cancer drugs. In 1990, he joined the faculty of the Pennsylvania State University College of Medicine where he ascended the faculty ranks to the level of Associate Professor. In 2002, Dr. Welch joined the faculty of the University of Alabama at Birmingham as a Professor of Pathology and Director of the Metastasis Program at the Comprehensive Cancer Center. Since 2002, Dr. Welch has led the NFCR Center for Cancer Metastasis. He is currently the Founding Director of the Department of Cancer Biology and a Professor at the University of Alabama. Moreover, Dr. Welch is a Komen scholar and president of the Cancer Biology Training Consortium. 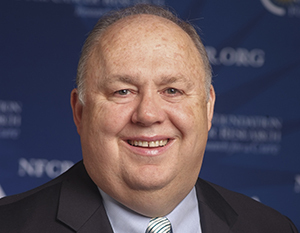 He has served on numerous grant review panels for the National Institutes of Health, Department Of Defense, American Cancer Society the Susan G. Komen organization, the European Union and other international agencies. Dr. Welch has served as editor-in-chief for Clinical and Experimental Metastasis and is currently a deputy editor at Cancer Research. He is also co-editor of the textbook Cancer Metastasis. Throughout his career, Dr. Welch has authored more than 192 peer-reviewed publications and more than 20 book chapters, and he’s the recipient of numerous mentoring and teaching awards. Your ticket for the: Danny R. Welch, Ph.D.